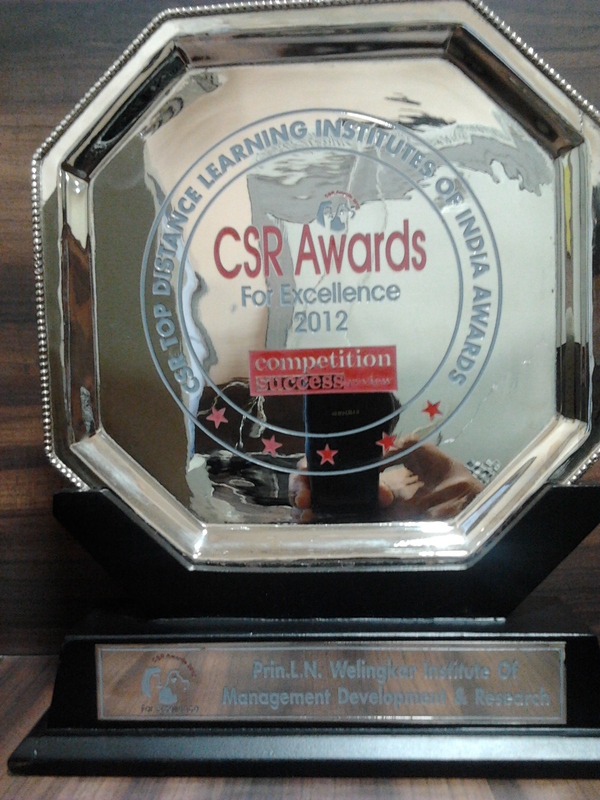 Welingkar’s distance learning programs have been recognized once again for their excellence. This time the honour comes from Competition Success Review, the largest circulated monthly magazine in English. 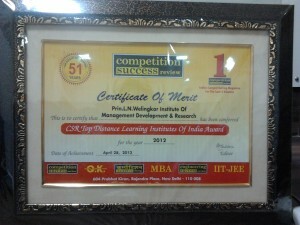 Competition Success Review felicitated Welingkar Institute with the ‘Top Distance Learning Institute of India’ award in the West Zone. The award was given by Mr. SK Sachdeva, Chairman & Managing Director, CSR group at CSR Awards Night on April 28, 2012 at Hotel Le-Meridien, Windsor Place, New Delhi. The parameters for the rankings were: resources and the study centers, faculty and counselling, program delivery, admission system and networking, industry interface along with the uniqueness of the program that gives it an edge over others. Earlier this year, the distance learning programs of WeSchool were adjudged third by Zee Business subsequent to a comprehensive nationwide survey and second by Business World in the BW-Synovate Distance Education B-school Survey 2011. The distance education at WeSchool has carved out a niche for itself with some of its very unique features which form its quintessential part. The course content here is quite differently structured. There is no concept of ‘core’ and ‘electives’ in the second year; all the subjects are specialization-specific. The content keenly follows the industry. Students also have access to online video library called, ‘WE TUBE’ where they can view video lectures on relevant topics. Industry visits and business simulation games also play a significant role in grooming the students suitably for the industry. The institute has also pioneered the concept of virtual classroom; the faculty reaches directly to its students at their homes through internet based two- way audio-video lectures. This has been and proved quite pragmatic and very helpful to the students. Also worth mentioning are the experiential learning methods including the trekking modules to the Sahayadri/ the Himalayas which test and train the students on perseverance, decision-making, problem solving and thinking on their feet. The activities are designed to guide them through their own areas of weakness and applying solutions to enhance their performance significantly. Team work, problem solving, communication, presentation skills, decision making, leadership and many more traits are thus consistently worked upon. Also quite appreciated is its rapid response system wherein students’ queries are solved instantly in minimum possible time via smses or emails depending on the nature of the questions. To keep its students industry ready up- to- the minute it offers newswire services that update them on the latest developments in their chosen specialization. Quite unlike the traditional distance education mode, WeSchool has put in place the placement support system where regular and relevant updates on corporate requirements are shared with the students as per their verticals, right from the day of their enrolment.